Apex hand drivers allow nutrunning in all types of applications. Quality design and construction give Apex nutsetters a long service life and durability. With Apex hand drivers you are assured of high quality and industrial strength. Apex hand drivers are specifically designed and manufactured for high impact use, and made from a tougher and more ductile alloy steel which is then heat treated for extra durability. 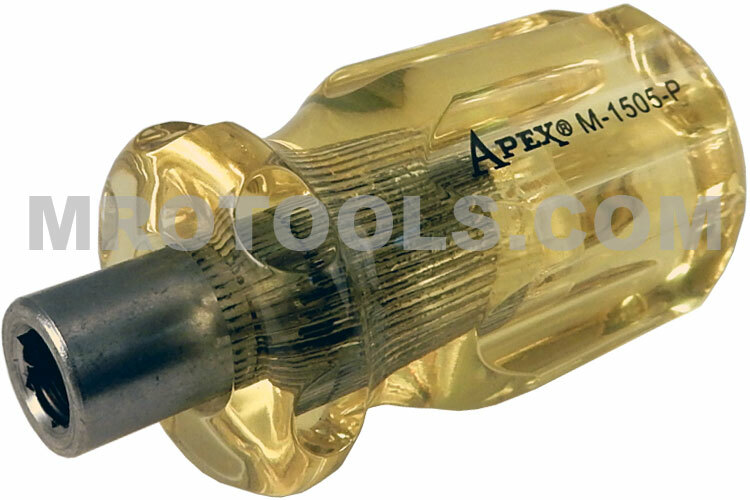 The M-1505-P Replaceable Apex Brand Bit Driver For 1/4'' Insert Bits, Magnetic is one of thousands of quality tooling products available from MRO Tools. 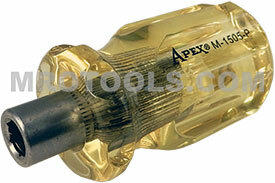 Please browse Apex Hand Drivers for tools similar to the M-1505-P Replaceable Apex Brand Bit Driver For 1/4'' Insert Bits, Magnetic. M-1505-P Replaceable Apex Brand Bit Driver For 1/4'' Insert Bits, Magnetic description summary: Apex brand magnetic replaceable bit drivers. Female Hex Size: 1/4'' Overall Length: 2 3/8''/60mm Blade Projection: 3/8''/ 10mm Quantity discounts may be available for the M-1505-P Replaceable Apex Brand Bit Driver For 1/4'' Insert Bits, Magnetic. Please contact MRO Tools for details.